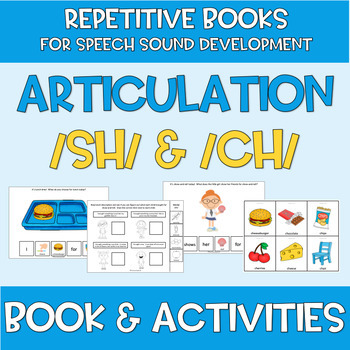 Articulation SH and CH Speech Therapy Adapted Book & Activities! PLEASE CHECK OUT MY PREVIEW FOR THIS PRODUCT!!!! This resource includes TWO 10-PAGE REPETITIVE books - one for /sh/ and one for /ch/! 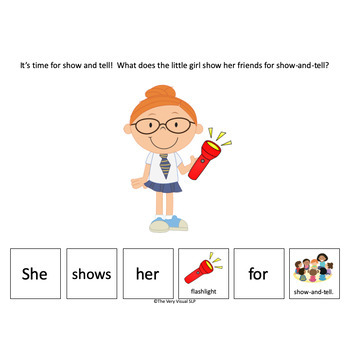 The repetitive phrase targeted in the /sh/ book is "She shows her (target word) for show-and-tell." 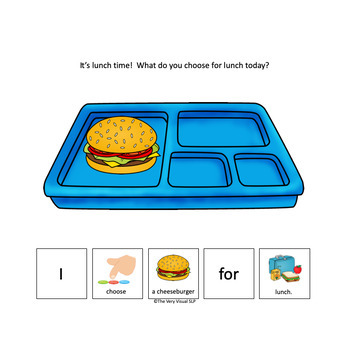 The repetitive phrase targeted in the /ch/ book is "I choose (target word) for lunch." 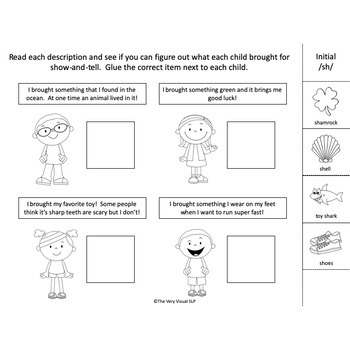 Includes 6 CUT-AND-PASTE WORKSHEETS, three for /sh/ (initial, medial and final) and three for /ch/ (initial, medial and final). Also includes 36 ARTICULATION CARDS – 18 for /sh/ (6 for initial, 6 for medial and 6 for final) and 18 for /ch/ (6 for initial, 6 for medial and 6 for final). VISUAL SUPPORTS on EVERY PAGE!! !